Slauson Middle School students can now enjoy the fresh autumn air during instructional time. 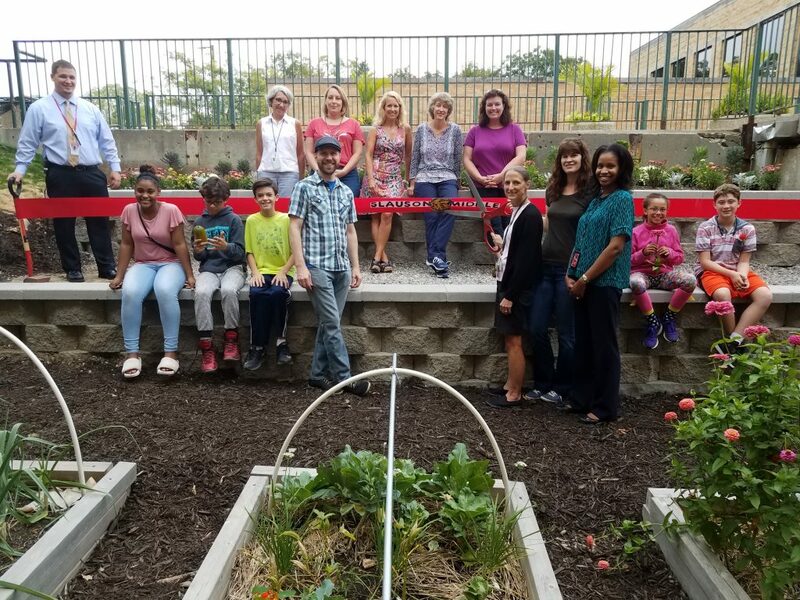 The ribbon was cut Monday afternoon on a new outdoor classroom, which features long benches created with retaining walls built into a slope facing the school garden near the building’s main entrance. Jeremy Chouinard tends the garden at the foot of the new outdoor classroom. The space was more than a year in the making, and began after Herrmann joined the school’s garden committee in the summer of 2016 after wrapping up her final year as garden coordinator of the Dicken PLANT garden. She, outgoing garden coordinator Jeremy Chouinard and math teacher Karen Cole made up the committee at the time. German teacher Denise Socher joined the garden team several months ago. Cole expressed an interest in doing something about the steep grassy slope in the garden area—which at the time was virtually unusable except for a small part of the top that had been flattened out to grow a few vegetables. Slauson students, staff and supporters gather at the new outdoor classroom prior to the ribbon-cutting. A plan was hatched that ultimately took a year to complete. Cole solicited a donation from Fendt. 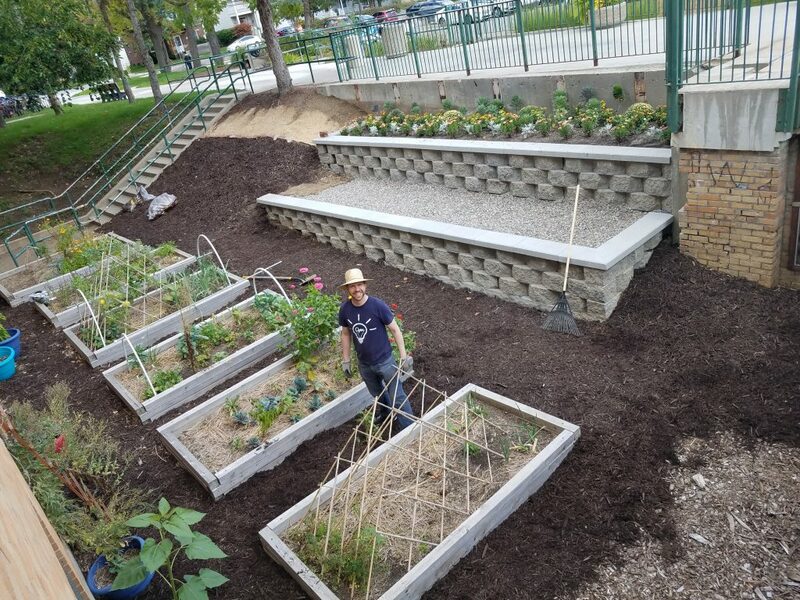 Herrmann wrote and received a $5,000 grant from Ann Arbor Farm & Garden, who knew her well from Dicken projects, and reached out to a Slauson mother, Janine Hutchinson, a professional retaining wall designer who agreed to donate her services for the outdoor classroom project. The total project cost of $6200 came from the $5000 grant, with the Slauson PTSO funding the remaining $1200. The project was installed about 2 weeks before school started, with construction taking less than 48 hours. Herrmann is a graduate of AAPS, and says she is happy to help beautify the district. “I’m so grateful to be able to give back to the school in this way,” she says. Great Job Folks! Fendt was very happy to help such a wonderful cause. Also Cudos to J9 Design (Janine Hutchinson, P.E.) for her part. As well as a “professional retaining wall designer” Janine Hutchinson is a licensed civil engineer!